SkullCandy Roc Nation Aviator mixes style and quality for an unparalleled experience. 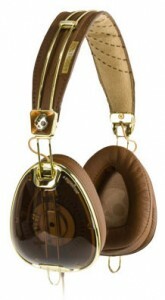 The Roc Nation Aviator headphones by SkullCandy come in four classy styles: Brown, Black, White and Silver. Once you put a pair of these on, you may not want to take them off. The audio output mixes nicely compared to most competitors, and like most SkullCandy products, it certainly delivers on bass. The SkullCandy Roc Nation Aviator's construction is just above mediocre. They look and feel very nice but feel a little cheap. While the SkullCandy Roc Nation Aviator headphones deliver a lot of sleek style and performance, they're definitely not made for heavy use. The in-line control is somewhat awkward and will probably not be a fan favorite. The delivered-as-promised sound, however, more than makes up for it. 10 for 10 on packaging for this device. I felt I was opening some super high end product. In fact I can't bring myself to throw away the hard case that these headphones were packaged in. I really felt the experience opening these so I promise you they would make a fantastic gift for someone. The SkullCandy Roc Nation Aviator Headphones are sleek, stylish and perform quite well when it comes to delivering quality audio output. While they are fairly lightweight, their construction also reflects this. Thus, the SkullCandy Roc Nation Aviator headphones should be well taken care of. The promised sound quality was more than delivered. The in-line sound control could have been better designed for easier use. While there are cheaper competitors on the market, these headphones are definitely worth an investment for those who enjoy great sound quality. The headphones are very comfortable around the ears. You can listen to music for far longer on the Roc Nation Aviator headphones then most other brands and models. No noise reduction that I can notice so these are not really the right headphones for those who have loud noises around them. Smaller noises like fans going can be heard while the music is not playing but as soon as I turn on my Ipod I don't notice the outside sounds. This over the ear headphone set was made for the Ipod/Iphone. You have an in-line Track Control, Volume Control and a Mic. Very nice for listening to on your Iphone. If you are looking for a very sleek looking headphone set that will get noticed I strongly recommend the SkullCandy Roc Nation Aviator headphones. The brown ones shown in this review are the ones we tested out. You have a choice of several different designs and colors so you are sure to find on that meats your needs. 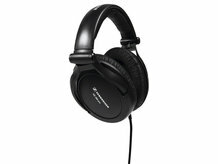 The SkullCandy Roc Nation Aviator has earned the Staff Recommended award. These headphones provide great sound quality. They feature a folding design that makes it easy to carry around. The closed-back design cancels out quite a bit of environmental noise. There is a bit of extra boost in the mid ranges that some uses may find distasteful. These are high-performance headphones that provide great sound quality throughout all the ranges of sound. Normally, closed-back headphones have a level of distortion and coloring of sound which has been a bane to their kind. However, this headphone set eliminates that problem to quite an impressive degree. Sennheiser has always been committed to providing the best possible audio solutions when it comes to headphones. Another addition to this family of extremely well-made devices has been the Sennheiser HD 380, which, simply put, takes your breath away with awesome sound quality. This headphone set could be classified as belonging to that elite group of headphones that are used by sound engineers and recording artists. The Sennheiser HD 380 features a large, black design with massive leatherette ear cups and a cushioned headband. This design ensures comfort for extended periods of wearing. Thanks to a unique foldable design, the Sennheiser HD 380 can be folded up and carried with you when you don't need it; once folded, it would even fit within a large pocket. Thanks to the large closed-back ear cups, the Sennheiser HD 380 also cuts out a major part of environmental noise so that you can enjoy whatever you are listening to better. The Sennheiser HD 380 provides great sound quality without being hindered by the distortion and amplification that other headphones of the closed-back variety display. There is a mild coloration in the mid ranges however, but you can quickly get used to it. This is definitely a step up from other headphones with similar design patterns. In conclusion, it must be said that the Sennheiser HD 380 is a revelation when it comes to headphones, and no one should ever hesitate to buy one, provided you can handle the price tag.